It can be extremely difficult for a new company to break into an industry as crowded as sports betting. There are dozens of bookmaking options already available, some of which have been in business for decades. MoPlay, though, chose to simply ignore this supposed difficulty and aim straight for the top. Having only launched in June 2018… they almost immediately secured a partnership with one of the biggest football teams in the world, Manchester United. Oh, and they also formed a partnership with fellow Premier League side Watford too, for good measure. How’s that for making a splash? In MoPlay, we find a bold new bookie who have gone straight for the on-the-go market, strongly prioritising mobile over desktop. Is there enough here to satisfy both sets of users? Can this bookie actually offer substance, to back up its flashy marketing deals? These questions, and plenty more, will be answered in our comprehensive MoPlay review. Big-time partnerships are great for getting people to hear about your sportsbook… but to make them actually sign up, you need an enticing welcome offer in place. Fortunately, that’s exactly what MoPlay have! This really is one of the better welcome offers available right now. The minimum odds of 1/2 are fantastic, giving you every chance to win your qualifying bet and bag the free bets. While it’s slightly annoying that you have to use both MoPlay free bets within seven days… you can’t really argue with tripling your money on a £10 stake. Finally, we want to give credit to MoPlay for going out of their way to thoroughly explain how to trigger this offer. Click here, and you’ll see they go above and beyond stating the legally-binding Ts & Cs, and really put the effort in to making everything clear for their users. MoPlay’s welcome offer serves as a wonderful introduction to their sportsbook. While they can’t quite match it with their ongoing promotions, you’ll still find a respectable range of offers here. Technically there are eight ongoing MoPlay offers… but we wouldn’t actually count all of those as genuine promotions. Simply having a bet builder, for example, or a cash out feature – which essentially every bookie does nowadays – aren’t exactly special offers! Of the six genuine promotions, Club ProMo is the most eye-catching, and is far more exciting than your average accumulator-based offer. If you place £10 on a multiples bet with three or more selections, at combined odds of at least 1/2, MoPlay will give you a £5 free bet. Essentially getting a 50% return on your stake is great value, and – best of all – you can activate this offer every single week. Elsewhere, MoPlay offer a series of ‘enhanced odds’ and ‘best odds guaranteed’ deals. They actually specifically boost the odds for certain markets on Manchester United and Watford games, thus helping to drive a little more action onto their partners’ games! There’s also an excellent NBA promotion – ‘Overtime Insurance’ – in which, if your over/under or spread bet loses in overtime, you get your entire stake back as a free bet. While we might like to see a few more options here, the ongoing MoPlay promotions which are in place are very good indeed. Football is by far the biggest betting market out there. Because of this, and the fact that they’re in partnership with two massive teams, you’d expect MoPlay to have made their football betting section a priority. The layout of the section is clean, crisp, and easy to navigate. You’re automatically shown all the biggest games for that day, divided by competition in order of popularity. On a Saturday, for example, you’ll see Premier League games at the top, Spanish La Liga games below that, then Serie A games, and so on. This helps you to find the juiciest matches as quickly as possible. If you want to find a specific competition, though, you can easily do so using the ‘All Competitions’ option on the section’s main menu. By viewing the competition this way, you can also find the Outright markets for each league and cup – winner, relegated teams, top goalscorer, and so on. One feature we absolutely love is the inclusion of statistics, which are available for seemingly every game, from the biggest Premier League clashes to Japan J-League 2 encounters. These include interesting facts (Team A haven’t won at home in four games, for example), head-to-head records between the two teams involved, and much more. Getting this level of information straight from your bookie is a big bonus. Elsewhere, in-play betting and a MoPlay cash out feature are present and correct, as you’d expect from any modern bookie. There’s even a dedicated ‘Live Betting’ section, which can be accessed instantly from the top menu. While there’s no live streaming yet, this is a feature we’d certainly expect to be added in the future, based on the quantity and quality of the features elsewhere on the site. As with most bookmakers, MoPlay’s clear secondary focus – after football – is horse racing. Alongside a useful Best Odds Guaranteed deal, in which you’ll get the starting price for a race if it’s better than your initial price, MoPlay also offer enhanced odds on selected races. In-play betting is available for a sizable selection of sports, ranging from horse racing, to NBA basketball, to rugby and cricket. You’ll also find longer-term bets for all your usual favourite markets, including boxing, golf, darts, and so on, in addition to a few less-heralded options, like bandy and hurling. On-the-go betting has become so popular in recent years that some bookmakers are actually prioritising their mobile product over its traditional desktop counterpart. MoPlay certainly fits into this category. In SBTech’s press release, when they were commissioned to create the platform, MoPlay was described as a ‘mobile-first sportsbook’ which would ‘push the boundaries of what can be achieved in mobile gaming’. That might be PR hyperbole, but MoPlay’s mobile offering really is excellent. The app provides absolutely everything you’d expect from a fully-fledged desktop site, all on your mobile device. It allows you to bet on a huge range of markets, and gives you access to a range of special offers, including daily promotions. While there are complaints of instability on the iOS version in the App Store reviews, in which the MoPlay app only averages 3.6/5, we can’t say we suffered any such problems. In our tests, everything worked extremely quickly and smoothly, and we experienced no crashes or other errors. In fact, the only negative note we have is that – for some reason – the MoPlay Android app no longer seems to be available. The link to the Google Play page is dead, and – despite there being reference to an Android app on the website – there’s no instructions as to how to actually download it. Considering MoPlay’s focus on mobile features, this is baffling to say the least. Signing up to MoPlay is extremely easy to do, thanks to their streamlined three-step process. At the first stage, you enter a few basic personal details, including your name, date of birth and email address. Next, you give your address and phone number (it seems to us like these could have just been included in the first step… but what do we know?!). Finally, you determine a username and password, and you’re given the opportunity to set daily, weekly or monthly deposit limits. This third stage is also when you must opt in to the welcome offer, so make sure you check that box! Once you’ve finished those three steps, your account is created for you. You’re now free to place a deposit, and start betting away to your heart’s content. This is one area in which the bookmaking titans regularly triumph over their smaller competitors, and – unfortunately – that’s also the case here. While the banking options on MoPlay aren’t terrible, they’re certainly lackluster compared to the bigger bookies. You only have four options for making a deposit here – credit/debit card, Neteller, Paysafecard and Skrill. While that should still give everybody a chance to fund their accounts, it would still be nice to see methods like PayPal and bank transfer supported. All deposits are processed instantly, and the minimum deposit amount is £10. The minimum amount for MoPlay withdrawals is also £10, and withdrawals made using Neteller, Skrill and Paysafecard will be processed within 48 hours, while credit/debit card withdrawals take 3-5 days. Like most bookmakers, MoPlay go into very little detail about security measures on their website. They do have SSL encryption in place (again, like every other bookie), but there’s essentially no other information available. That said, MoPlay do hold a full license with the UK Gambling Commission. If you’re thinking about signing up, and are wondering ‘Is MoPlay legit?’, this should give you peace of mind that MoPlay adhere to strict security protocols, and are generally subject to industry best practices. As with banking options, this is another area in which newer or smaller bookies tend to struggle. In this case – again, like their banking options – MoPlay’s customer service is okay, but it’s certainly nothing special. There are three main ways to contact MoPlay. You’re primarily directed towards live chat, which is obviously most people’s preferred customer service method anyway. If that’s not available, you can also get in touch using a ticketing support system or Twitter. The MoPlay team do a good job of replying quickly to their Twitter messages, either solving the problem directly or – more commonly – asking the customer to send their account details via DM. Finally, there’s also the FAQ section. While it’s not exactly ‘bad’, this still certainly seems to be a work in progress. There’s generally a lack of articles, with some of the articles which are present pretty clearly serving as filler to bulk out the section, and most being very light on actual text. Still, it’s very early days for MoPlay, and we’d expect to see this improved over time. MoPlay are comfortably one of the newest faces on the sports betting scene. They have only existed since mid-2018, with their parent company – Addison Global Limited – being founded a year before that. While this newness might put some punters off, the actual technology has been provided by SB Tech, who are one of the most prestigious and experienced names in the industry. Addison Global Limited is based in tax-friendly Gibraltar, like many other betting-related companies, but MoPlay does have a full British Gambling Commission license. Given the enormous funding which Addison clearly possess, we wouldn’t be surprised to see them open more sports betting sites in the coming months and years. This company is definitely one to keep an eye on. Some people might be automatically inclined to steer clear of ‘unproven’ bookmakers, simply because they don’t have any kind of track record. We completely understand this line of thinking… but if you’re at all willing to put it aside, and give a new bookie a shot, MoPlay should absolutely be one of your top candidates. Considering their newness, it’s incredibly impressive how much MoPlay get right. Their focus on mobile features pays off in a big way, with their on-the-go betting being high enough in quality to compete with many bigger, older competitors. Their football section is also excellent and, in general, using their services is a smooth and trouble-free experience. They don’t nail everything of course, which is to be expected considering their youth. Neither MoPlay’s customer support nor their banking options can compete with those you’ll find from their more established competitors, and the current lack of an Android app is both strange and disappointing. That said, there’s no doubt in our minds that – even now – MoPlay is definitely worthy of your consideration. There’s no reason whatsoever why you shouldn’t at least take advantage of their excellent ‘Bet £10, Get £30’, try out a few of their solid ongoing promotions, and simply see what you think. Joe is a freelance writer and digital nomad, who splits his time between Asia and Europe. Wherever he’s based in the world, though, he can invariably be found in an Irish bar on a Saturday afternoon, watching the Premier League and complaining about his fantasy team. Joe is a long-suffering Arsenal fan, who has recently contracted a serious case of Emery Fever. 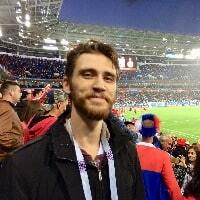 In addition to his work for Football Betting Sites, Joe also runs his own website, Full 90 Football. Alongside regular Premier League betting tips, F90F also features Fantasy Premier League advice, and analytical articles on the beautiful game. Outside of football, Joe writes content for a wide variety of clients and websites.